This anguished face came to me in my dream, and seemed to exemplify centuries of pain and isolation. His drumbeat reverberated through the earth in olden times. 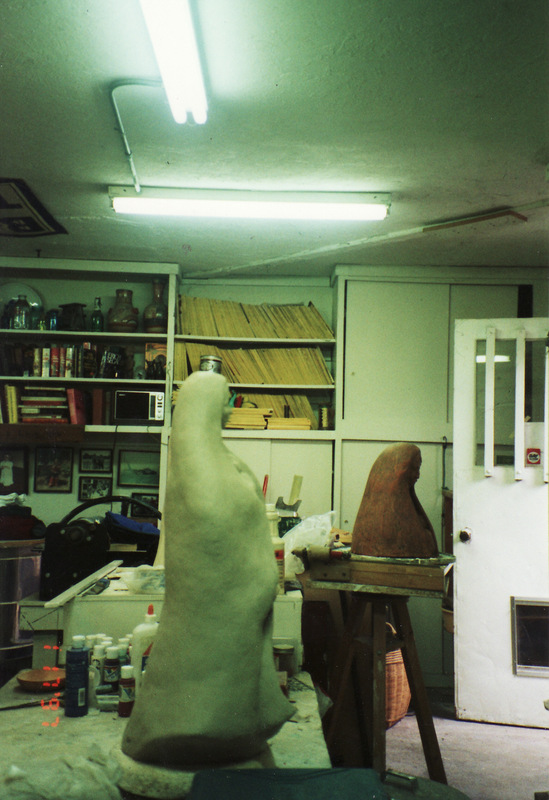 Step into a sculptor/potter’s studio and you are surrounded with the “home-again” smell of wet clay. Delicious in its earthiness, for who of us has not dabbled our hands and our toes in mud as a child of summer? The other earth smells of glaze materials, iron, copper, tin, magnesium, plus the thick powdery odor of dry plaster fill your nostrils. Odious perhaps if this is not your venue of choice, and as singular as the “divine” fragrance of oil paint and turps to the painter. If you have been obliged to be away from these smells as I have for the past year, it is a treat to visit a fellow potter’s studio and smell the familiar odors of creative art being made. People have been making things out of clay for longer than anyone can know. Food utensils, ornaments, and images of people and animals are found all over the earth, and the art is as fresh as when it was made by these ancient hands. 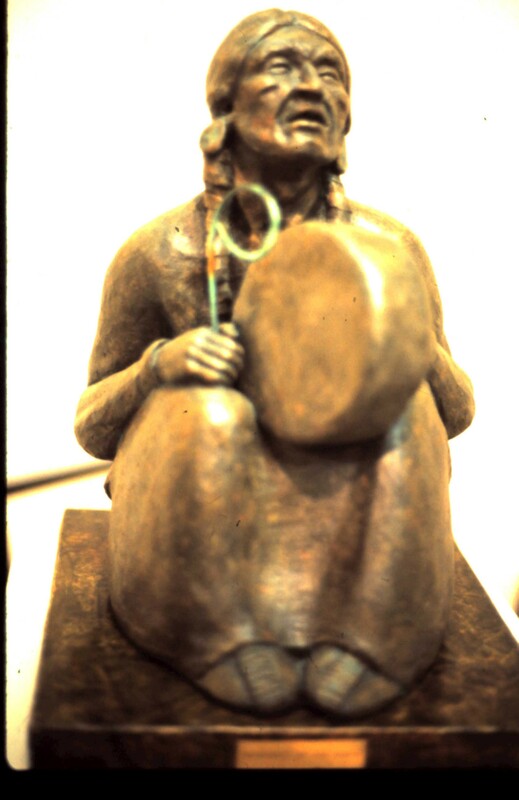 The same skills are used today in building a pot or a sculpture as was used so long ago. We recently visited an exhibit of the Terracotta Army from China at the Asian Museum in San Francisco, and I marveled at the enormous clay warriors and horses all made by the same coiled clay method used today by the potters of the Southwest. This strong connection with ancient potters fills me with peace and a longing for something indefinable. My own connection only goes back for a couple of hundred years to England and then to Canada, where my ancestors had potteries. I have a glaze recipe which was used for Royal Doulton pottery, which calls for enough material to keep several artisans supplied for a lifetime! I have worked in clay, wax and bronze, molding the clay and wax into recognizable shapes for most of my life, and clay has given me the most sublime pleasure. Your hands are your implements to create what your mind sees, much as writing in that respect. Both are solitary endeavors, demanding focus of thought. Working with clay, I feel I am connected in a small way to something timeless yet ongoing. This is my studio with a work in progress. It had been a long time since I had picked Oregon blackberries. Getting tangled in the thorny bushes and scratches on your arms and avoiding hungry bees is part of the fun of trying to fill a pail with the biggest juiciest berries you can get at. It was early in the summer, but the weather was warm, and my mother and I had decided that a blackberry pie would taste pretty good with dinner if we could find enough. In long-ago years, during the War, I had walked along these back roads alone, picking and eating and not realizing at the time what a gift Mother Nature had given us. In those days I knew all the hidden places berries could be found, but it had been a long time, and now on this return visit, I saw that my mother had discovered new places. The pasture was close to the Rogue River, and if you stood in just the right place you could see the river and part of the rock quarry which had been owned by my Dad’s cousin. I often swam in that cold river trying to outdo my two older boy cousins who always bested me in nearly everything. They challenged me to hop on water skis for the first time one day and were flabbergasted when I actually got up and rode all the way to the dam without falling. They bet me I couldn’t do it again, but since I now had nothing to prove I didn’t take their bet, and I never got on water skis again. For many years, Dr. Advice and I were avid competitors across a tennis net. He had a vicious lob, but a lousy backhand. Later when he told us that he was the creator of the Quarter-Pounder hamburger, we laughed in disbelief. figuring that since it was such a well-known icon of the restaurant chain it had been there from the beginning. Our small-town provincial minds had trouble believing that someone we actually knew was responsible for this, and it was too much to accept. However, hanging in the restaurant was a large framed picture of him holding one of these “culinary delights”, with an appropriate credit printed at the bottom, and later we watched a television special about the restaurant chain, and there—right on the screen in front of us, was proof that Al Bernardin was indeed the inventor of the famous “Quarter-Pounder hamburger”. They say a picture is worth a thousand words. Now, I don’t know if you have ever sunk a tooth into one of these hamburgers, and I am not one to ever praise or discredit another’s product, and it is better to let you decide for yourself anyway. My experience with hamburgers started when I was a small child, who went with my grandmother to visit the “Pike” in Long Beach, California. The “Pike” was an entertainment boardwalk in the 1930’s, though I never understood why it was called a “Boardwalk”, since the walkways were cement sidewalks. The shop we went to was named “Wimpy’s”, which was a salute to a character in the Popeye comic strip. The hamburger was called a “Wimpy burger” obviously. The word “wimp” had not yet attained the definition it received later as a derogative term among the young people for a weak, ineffectual person. In my recollection, the hamburger cost a nickel, but it could have been a dime. A fair price in those days for a meat patty between two bun halves. I’m sure the ice cream cone which always went with it did cost a nickel! Dr. Advice and I do love a good hamburger, though today we have been known to frequently spend $8.95 for one. But today’s burger comes with fries, and sports a leaf or two of lettuce, a slice of tomato, a pickle slice, and cheese. Mayonnaise of course, and catsup on the side. The sloppier the better, and a glass of cold beer to wash it all down. Author kaytisweetlandrasmussen83Posted on May 18, 2013 Categories Food, Sports, UncategorizedTags Al Bernardin, Dr. Advice, hamburgers, long beach california, McDonald's, Pike boardwalk, Quarter-Pounder, tennis, Wimpy's9 Comments on McDONALD U. It was one of our all-too-seldom warm evenings, and so I grabbed two plates, piled some salad on them, poured some iced tea, and we slipped out into the garden. It is so lovely at the this time of year, with roses in full bloom and the scent of jasmine filling the air, and we have to take advantage of every opportunity to just sit and enjoy it. Charlie, the resident Jack Russell Terrier, was happy too, and after checking out the bushes for unwary lizards and such, settled down under our feet in the shelter of the big white table under the arbor. Just as Dr. Advice and I were toasting each other with our gourmet Lipton tea, a large, black and decidedly ominous shadow swooped low over the warm patio, and settled on the roof of the house. We glared at each other and set our glasses down. “They’re back”, was an unnecessary observation from my husband. Whatever else they may be, and we all know stories of their superior intelligence and trickiness, they are loud, noisy and obnoxious as they scream out their attention-getting squawk, inviting all the other crows in the neighborhood to come watch us eat our dinner. Periodically we receive visits from most of the crow population of Northern California, and they take turns washing their food in the birdbath, and probably do a lot of other things in it too that I don’t want to know about. It was pretty cute at first, but then they began stealing food from other birds and hiding it. Dr. Advice remembers watching the crow cousin, the raven, in Homer, Alaska at a seafood packing plant. A worker was moving a large tarp-covered bin filled with shrimp. One raven sat at the front of the bin-keeping the worker busy, while his companion on the rear end was flipping the tarp off and tossing shrimp out to his waiting companions on the ground. They have discovered the great secret of humans, there’s safety in numbers. On another occasion, this time in Wrangell, Alaska, a large and lazy German Shepherd, having recently been offered a scrap of meat, painfully got up and ambled over to retreive it. A couple of wily ravens joined forces, with one awaiting at the dog’s head, and his friend annoying the dog from the rear. As the dog tried vainly to take the meat, the one at the front grabbed it and flew away. While we bemoan the visitation rights of our crows, the famous ravens at the Tower of London are not only welcomed, but have clipped wings to keep them around and captive. The rule is there must always be six birds, and if one disappears for some reason, they have to bring another in. Only one bird survived the Blitz during the Second World War, so Winston Churchill ordered more brought in to bring the flock up to the correct size. Superstition persists that “if the Tower of London ravens are lost or fly away, the Crown will fall and Britain with it.” I have never heard the origin of this belief, or how they settled on six birds instead of ten, but they even have a bodyguard in livery, who makes sure they behave themselves. 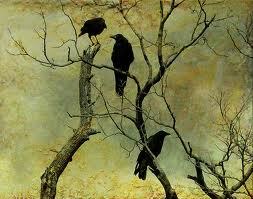 The ravens are enlisted as soldiers of the kingdom, and can be dismissed for unsatisfactory conduct. They are all named, and Raven George was dismissed and sent to Wales for attacking TV aerials. A few years ago another bird got his dishonorable discharge for visiting a local pub. You can’t blame a bird for lusting after a cool Guiness on a hot day.